Species name from the Latin word, paradiseus, meaning ‘paradise’ and possibly referring to the Blue Crane’s almost angelic appearance. Blue Crane, Paradise Crane, Stanley Crane (Eng. ); bloukraanvoël (Afr. ); indwe (Xhosa); indwe (Zulu); mogolodi (Sepedi). Evidence suggests that their diet is predominantly plant-based. However, Blue Cranes are omnivorous. They have a varied diet consisting of plant material such as small bulbs, seeds and roots, and animals such as insects (especially grasshoppers), small reptiles, frogs, fish, crustaceans and small mammals. They also eat fallen grains, e.g. wheat and maize kernels, and lucerne leaves. Blue Cranes are monogamous and breeding pairs nest alone, away from other Blue Cranes. They are territorial when breeding, and will chase other Blue Cranes away from their nesting site and its vicinity. They prefer nesting sites in secluded grassland in higher elevations where eggs are laid in the grass or on the bare ground. In agricultural areas, they nest in pastures and fallow fields, as well as in crop fields when stubble becomes available after harvest. In winter, when they are not breeding, Blue Cranes are sociable and nomadic, whereas in summer they are sedentary and dispersed as breeding pairs. Blue Cranes are single-brooded – breeding only once a year. They normally lay two eggs, which are incubated by both sexes. Incubation lasts about 30 days. Both eggs usually hatch, but due to sibling aggression, sometimes only one chick is reared successfully. The males take the primary role in defending the nest against possible danger. The chicks’ initial growth is centred on their legs and thighs, giving them an ungainly appearance when young, but making them very fast. Chicks fledge (first flight) between 3–5 months of age. At the end of summer, the pairs and their young form groups; groups merge to form flocks, and there is then a general movement away from breeding sites. These winter flocks often number at least 50 birds and occasionally reach 300 or more; the birds feed together in old fields and roost together at night in shallow dams and ponds. Although sociable in winter, mature Blue Cranes probably remain permanently paired. Breeding sites are used year after year if the birds are not disturbed. It often forages alongside Crowned Cranes Balearica regulorum and Wattled Cranes Bugeranus carunculatus, especially in croplands. It has been recorded hybridising with the Wattled Crane. Blue Cranes have adapted well to the changes made to the landscape by agricultural activities. They usually nest in moist depressions, such as at the head of the valley where the incubating bird has a wide view and can sneak off if approached. They feed on a variety of food from insects to mammals, fish and vegetable material; this ensures that they have a wide range of food available at all seasons. They often forage in old lands and feed on spilled grain and they may be helped through the lean winter months because of this food source; at times, especially in spring, they are liable to be a pest in lands where crops are sprouting. The Blue Crane is South Africa’s national bird and such is probably familiar to many people since it is featured on the country’s stamps and coins, and is common in zoo and park collections. Birders from around the world come to South Africa to experience the great variety of typical African birds, including the almost endemic Blue Crane, and thereby give a boost to our economy through tourism. 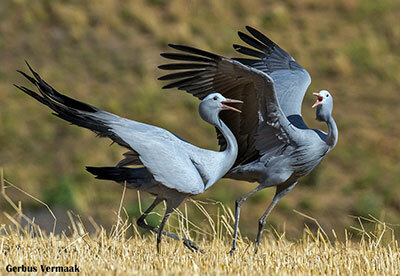 The Blue Crane is a special bird to amaXhosa tribe, who call it indwe. When a man distinguished himself by deeds of valour, or any form of meritorious conduct, he was often decorated by a chief by being presented with the feathers of this bird. After a battle, the chief would organise a ceremony called ukundzabela – a ceremony for the heroes, at which feathers would be presented. Threats to their habitat include human population growth, loss and degradation of habitat through afforestation with alien pine and gum trees. Predation of eggs by dogs, collisions with transmission lines, urbanisation and crop farming all contribute to the decrease in numbers observed especially in the eastern parts of their distribution range. 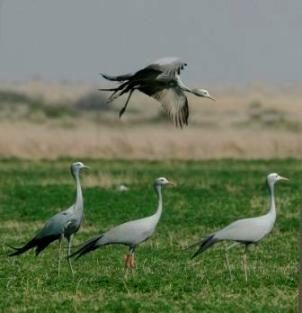 Poisoning by farmers, in response to the Blue Crane’s propensity for foraging in agricultural fields, have also had a negative impact on population numbers. In one recent horrific poisoning incident, one farmer killed over 200 Blue Cranes near Richmond. There are only about 25 000 Blue Cranes left in the world, about half of which can be found in the Cape Overberg. All populations of Blue Crane require ongoing and thorough monitoring, as well as the implementation of appropriate management strategies in farming areas. 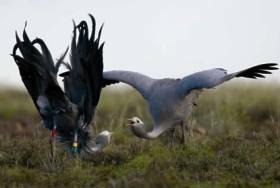 The South African Government has enforced legal protection for the Blue Crane. Other conservation measures that have been implemented are focusing on research, habitat management, education and recruiting the help of private landowners. The Blue Crane’s closest relative is the Demoiselle Crane (A. virgo) of Europe and Asia. Hockey, P.A.R., Dean, W.R.J. & Ryan, P.G. 2005. Roberts Birds of Southern Africa. VIIth Edition, John Voelcker Bird Book Fund, Cape Town. Harrison, J.A., Allan, D.G, Underhill, L.G., Herremans, M., Tree, A.J., Parker, V.J. & Brown, C.J. 1997. The atlas of southern African birds. Vol 1. Birdlife South Africa, Johannesburg. Andrews, S. & McClintock, D. 1982. Notes on Restio subverticellatus. The Plantsman 37: 230–233.